Current assessment methods of sustainable buildings do not adequately account for the users' needs. Given that over the life of a building, total salary costs far outweigh both operating costs and combined capital and rental costs, the occupants' needs are not something which should be sensibly ignored. This book presents an unbiased evaluation of thirty of the most cutting-edge, sustainable buildings in the world, in terms of the users' perceived comfort, health and productivity. The author has visited the buildings, interviewed the design teams and examined the findings of a sixty-question standardized user questionnaire. 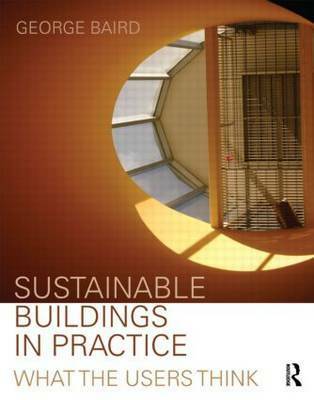 The book provides: thirty case studies covering mixed-mode, passive and environmentally sustainable commercial and institutional buildings detailed insights into the principles underlying the design of sustainable buildings worldwide, over several climatic zones and eleven countries, together with clear explanations and illustrations of innovative design practice a discussion of common issues and the lessons that may be learnt from a study of the performance of sustainable buildings in practice, from the point of view of the people who use them. This important book will be of great benefit to architects and engineers, facility managers of commercial and institutional buildings, as well as developers and researchers, academics and students in these fields. George Baird is a Professor of Building Science at the School of Architecture, Victoria University of Wellington. A Fellow of the UK's Chartered Institution of Building Services Engineers and New Zealand's Institution of Professional Engineers, he is an experienced researcher and writer and has been involved in the teaching of architects and building scientists for 40 years.